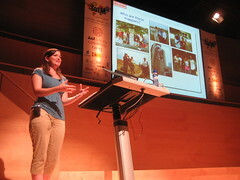 (photo Copyright All rights reserved by SINFOGEO)A few weeks ago we had a big OpenStreetMap conference, the annual “State Of The Map”. This year it was in sun-baked Girona. “State Of The Map 2010 felt like a coming together of all my OpenStreetMap friends from around the world” Read my more detailed write up over on my user diary. There was a diverse variety of talk topics, from OpenStreetMap technical nitty-gritty, to big business GIS uses, to worldwide travels and humanitarian mapping. The full list of sessions is here. My talk this year was part of the “community track”. I seem to have become the chief event organiser for OpenStreetMap in London, not because people massively admire the way I do it, but because it’s actually fair amount of effort, and I’m the one who got suckered into doing it. So this talk was mostly about my experiences of running these regular “mapping party” events, which we do every two weeks as a “mapping party marathon” (Sounds interesting? Check out when the next one is! )As I stressed in my talk, my approach is not ideal. There’s lots of things I don’t get around to doing. In particular I haven’t really tried to drum up press coverage of events. For one reason or another we never have very much luck at attracting new poeple. Although we try to be welcoming to new faces, it mostly ends up being a fun social meet-up where people know eachother. In the questions I was asked “what are my ideas for attracting new people?” to which I gave a hand-waivey response, but the truth is I don’t really know. 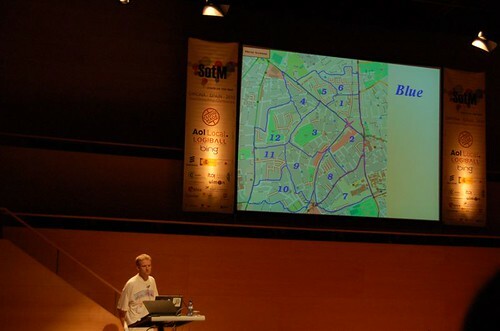 Ultimately I think the most important message she had, was that OpenStreetMap is too difficult for non-techy people. They get the idea of creating open maps. They enjoy the outdoor aspect of data gathering, and they will have a lot of fun when you first take them out to do this, but the minute they sit down and take a look at our map editing tools “you can see the look on their faces change”. Perhaps then the most important role of OpenStreetMap events, is to foster the existing OpenStreetMap community in an area. I would even go as far as saying that most outreach work at the moment should target boring old techy people and developers. This is not the end game. We absolutely want to attract young people and old people, mothers and grandmothers, but getting techy people excited about OpenStreetMap is easier and actually far more effective than anything else at this stage. They’ll learn the tools quicker. But more importantly, these are the people who will go out and embed OpenStreetMap in their websites, taking it to new audiences, or if we’re really lucky they’ll go on to help solve the technical problems of OpenStreetMap and make the next useabilitiy break-throughs. Obviously any publicity is good publicity. Any mapping party is a good mapping party, but I’m trying to consider where effort is best spent. Are we getting ahead of ourselves to try to engage with local community groups? Maybe I’m just working the geek angle, because that’s what I know best. As I said in my talk, press is important, and press (or PR?) is something OpenStreetMap needs to get better at.